I've seen a number of venn diagram solutions but I wanted to make a super simple one that allows for interaction. 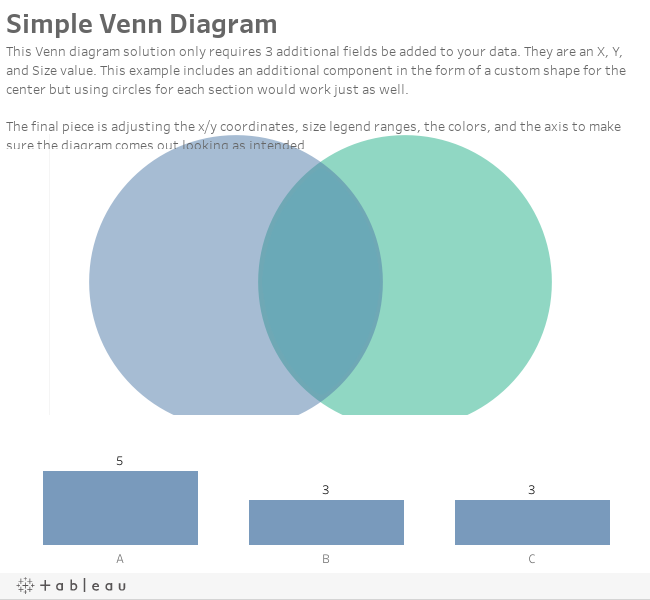 This venn only requires the addition of X,Y, and Size fields to your data or you can create case statements to assign these values. This example uses a custom shape for the center but using only Circle works just as well. This version resets selections after clicking to prevent large circle selects from blocking the intersection. When using this method make sure there is some indicator of that segement was drill down into. In mine I simple matched the colors in the bar chart but having a dynamic title might work simple enough. Please consider posting this example in the Workbook & Calculation Library. Please utilize the provided template and be sure to tell us the version of the sample workbook provided.